My daughter ate this meal! I was so shocked I about fell off my chair. Either she was really hungry or she’s finally starting to eat more types of food. I’m guessing she was hungry, but I’ll still take it as a battle won in this weary war. Lime and garlic chili sauce bring this dish to life. 1. Season chicken well with salt and pepper. Heat the oil in a large nonstick skillet over medium high. Carefully add the chicken and cook until golden on each side and chicken is cooked. Move chicken to a plate and cover to keep warm. 2. Add snap peas to the skillet and cook for two to three minutes. Add the broth, chili sauce and fish sauce and boil until reduced. About 5 minutes. Move the snap peas to a small bowl and set aside. 3. Stir in lime juice and peanut butter into the skillet and cook for a minute or two. Turn off heat. 4. To plate. Place the rice on a platter. Place chicken on top of rice and spoon sauce over the chicken. 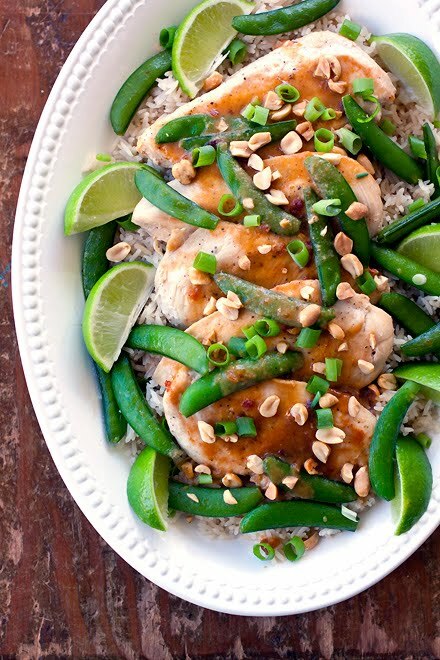 Tuck lime wedges into the rice and sprinkle top with peanuts and scallions. Congrads on your daughter eating this meal! :) I know how kids can be, some are very picky eaters. I know I would dig right into this! It looks yummy, and full of flavors! Great pic! This looks amazing and delicious. Could it really be that easy? Why have I been going out for Thai when I could make this yumminess? Cannot wait to make it, thanks Laura! Yay, something to do with the chicken in my fridge! This sounds so yummy! I haven't used lime very much in the past, but I recently made cilantro lime rice and it was soooooo good and ever since I've been experimenting more with it. It is pretty awesome! Yum! Love the flavors in this dish... Looks perfect. I found a new Thai place near me that I've fallen in love with so now I'm all about Thai. YUM. Oh sweet, i saw the title of this and jumped on it. I'd hold the fish sauce, but the rest... nice! and so nice of you to give Butteryum advice on the camera, her pics are awesome! And to think...I have oodles of snap peas to use up! Major score. Isn't it awesome when kids eat this kind of meal with great ambition. Ahhh, if only every meal could be this easy. Beautiful recipe. This looks so GOOD!! I wonder if I can make it with Salmon?? We saw you on food gawker we are your newest followers! Can't wait for more recipes. Oh my, this looks delicious Laura! YUMMMMM! Definitely want to try this soon! I made this last night, and it was delicious! Thanks!